In the afternoon we met with Carlos Sarti and Amanda Rodas of the Organization of American States, who spoke to us about the effects of the neo-liberal economic policy on Guatemala's poor and marginalized. Amanda Rodas is currently working on a reconciliation project; prior to this, she was working on refugee issues. Carlos Sarti is an anthropologist working in international development in collaboration with Denmark; his main focus is the transformation of Guatemala after the Peace Accords. Carlos Sarti and Amanda Rodas of the Organization of American States. The Peace Accords are the most important thing that happened in the 90s in Guatemala. 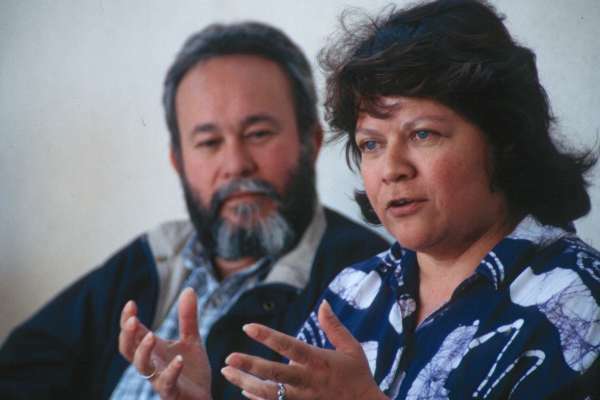 The Accords put an end to the many years of conflict; however, changes towards peace cannot happen overnight, mostly because not only infrastructures were destroyed, but also the social fabric of Guatemala was destroyed: there was a genocide. The Peace Accords are still a fundamental step, even though only formal, towards a better future. In fact, they set out the agenda for the development of democracy and reconciliation. In other words, the Peace Accords are the guidelines to overcome all the obstacles against peace. The first government after the Peace Accords represented the new faction of capital in the country: the new business, which some people refer to as the new right. This government, led by the PAN (Partido de Avanzada Nacional - "National Advancement Party") was really a small oligarchy: bankers and businessmen linked with the family of the president. Because of this, a lot of the first reforms included the development of infrastructures, but not an improvement in the conditions of people. The following years saw then a decrease of government support, both nationally and internationally, and Guatemalans unhappiness set up the context for the following elections. Later a “new” actor made its electoral debut: the FRG (Frente Republicano Guatemalteco - Guatemalan Republican Party). It included general Efraín Ríos Montt (allegedly one of the worst human rights abusers in the 1980s) and front-runner Alfonso Portillo, who contrary to Ríos Montt had a leftist history. The FRG campaign focused on the struggles between rich and poor and the claim that the PAN was the party of the rich. The ground was very fertile for this kind of message, so the FRG ended up winning the elections. Because of the many interests within the FRG (ex-military, leftist, Christian-democrats, capitalists), many have doubts about what the current government really represents. Their program is very reformist with an authoritarian style; but still, it is an articulation of contrast. One of their first changes was the increase of teachers’ wages. This was done as a symbolic act to show that this government represented the poor, but also because if the teachers are happier they will transmit their contentment to the kids and their families giving the impression of a better functioning government. 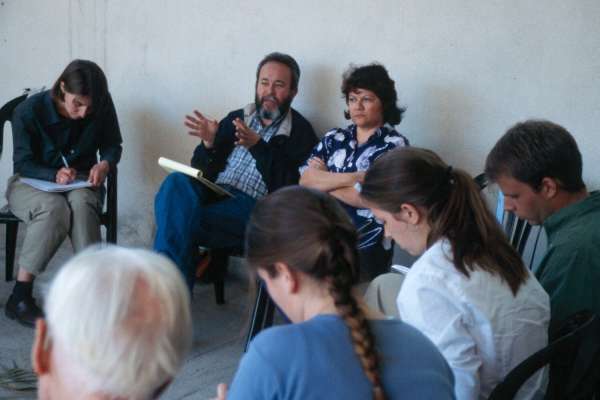 Carlos Sarti and Amanda Rodas (top center) of the Organization of American States. Other changes include the Pacto Fiscal (Fiscal Accord), the Pacto por la Governabilidad (Governability Accord), and the Pacto por la Decentralización (Decentralization Accord). The Pacto Fiscal intention is to correct the high fiscal evasion that is present in the country, which would lead to an increase of funds for the government. It also includes a tax increase from 8 % to 12%, and a proposal to have those who earn more to pay more taxes; however, it seems clear that it will be much easier to increase sales taxes, which are now 10%, than to have the wealthy people, who still have a lot of political influence, pay higher taxes. The Pacto por la Governabilidad is probably the most ambitious of all the accords. It functions with the Pacto por la Decentralización, and together they are trying to bring more power at the local level by concentrating on municipalities. This is based on the fact that most people tend to focus only on their microcosm and not at the national level. The current government has been in power for only 2 ½ months, and for now it is really hard to know which way it is really going. [Amanda Rodas:] I have been working with various organizations in Guatemala, and it has been very disappointing to see this government being elected because of what it represents. I actually wanted to leave Guatemala, but when I looked at the conditions of so many people and saw how desperate for change they were, I understood why they voted for the FRG: it was a chance for change and maybe for improvement. [Some of the delegates ask why is the United States so involved in Guatemala, and Amanda Rodas answered:] During the 50s, in the context of the Cold War, Guatemala and Central America were very important to the US in the battle between East and West. Now, Central America is important because of the Narco-Traffic War. Guatemala represents a very important ally for the US, and for that reason, the US ambassador, the Peace Corps and various organizations have a very strong presence in Guatemala. This is believed to create stability and maybe decrease the emigration level to the US and finally keep a check on the drug trafficking.